The original bread pudding recipe began life back in the twelfth century as the ideal means to use up stale bread while making it edible again. This was a necessity for folks living at that time, as they could not afford to let any scrap be thrown out – everything had to be eaten. The bread was simply steamed and enriched with an assortment of meat or fruit before baking. If a whole loaf had gone stale then the bread was opened up and the mixture poured inside it before it was baked. This bread pudding later became a staple of Christmas fare though that was not until several centuries later. Putting the bread into milk, or sometimes water, then adding to this sugar, butter, a little fruit and maybe some spicing, made another variation, which we refer to as bread and butter pudding. Despite the fact that this dish was made specifically to salvage bread that would otherwise have been thrown away, the thing that made the bread pudding recipe special was how the women of the day were able to take a piece of old food and turn it from something that was potential waste into a tasty desert treat. Simply soaking the bread would not do that but with the addition of the butter and fruit, it gave it a fuller taste. The sweet taste provided by the fruit made it into something that everybody could enjoy. How often were children given bread pudding in poor households when there was nothing else to eat and yet they thought it was cause for a celebration because of the sweet taste and the fact that it filled their little tummies? These days, bread pudding is made because folks enjoy it and not because they are afraid to go hungry and it seems that every family, chef, restaurant and cookbook has their own recipe variation. Cutting a favorite loaf, most often French or Italian bread, into cubes, and then adding in a mixture of raisins, butter and custard make one such recipe. This mix is then poured into a baking dish and then baked with water filling the rest of the pan. This is done to make sure it all heats at the same time and also to prevent the custard from heating too fast and curdling. 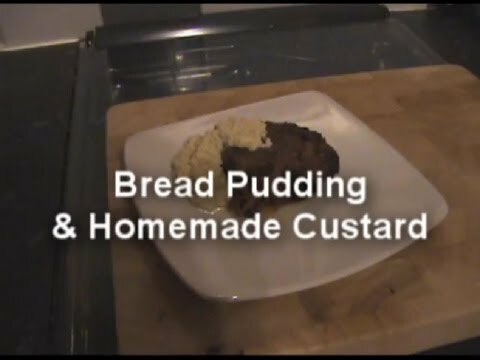 There are many variations on the original bread pudding recipe with numerous other ingredients being used to create a tastier pudding. Finding a good traditional bread pudding recipe is an absolute must if you want to try your hand at making this tasty treat.